Comfortable and durable, this Classic Brands 8-inch Full-Size Futon Mattress is built to last. Wrapped-coil innerspring system is topped with a sturdy microfiber cover and supportive foam so that you and your guests can get the sleep that you deserve. Individually Wrapped Coil Innerspring system ensures durability for optimal comfort and is resistant to wear and tear. The microfiber cover is easy to clean, just wipe with a damp cloth. 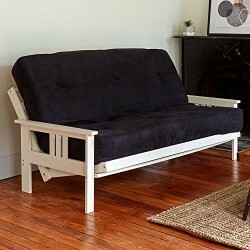 Classic Brands 8-Inch Futon Mattress can also be used on bed frames (with foundation/box spring)-does not include futon frame, mattress only; available in black and brown. The Classic Brands 8-Inch Futon Mattress is perfect for dorms, guest rooms, or anywhere you need to provide your friends and family a place to sit or catch some zzz’s. Smart packaging reduces the carbon footprint in the manufacturers shipping process. Our advanced packaging technology means we can roll-pack our mattresses and ship them at one-third of the normal size. Because of this process, we can ship more products per delivery and reduce the amount of carbon emissions. The futon mattress retains its initial quality and will quickly recover and return to its original shape after being removed out of the packaging. Easily folds when you don’t need it and it bounces back to original shape when you do. Classic Brands 8-Inch Futon Mattress Topper is backed with a 1-year worry-free warranty.